The Rotary Regenerative Air Preheater (RAPH) consists of a central rotating-plate element within a casing that is divided into sectors containing seals around the element. The seals allow the element to rotate through all the sectors, but prevent gas leakage between sectors while providing separate gas air and flue gas paths through each sector. In the tri-sector design, the largest sector is connected to the boiler hot gas outlet.The hot exhaust gas flows over the central element, transferring heat to the element, and then ducted away for further treatment in dust collectors and other equipment before being expelled from the flue gas stack. The second, smaller sector, is fed with ambient air by a fan, which passes over the heated element as it rotates into the sector. It is heated before being transported to the boiler furnace for combustion. The third sector heats air which is routed into the pulverizers and used to carry the coal-air mixture to coal boiler burners. 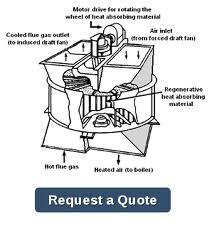 Thus, the total air heated in the RAPH provides: heating air to remove the moisture from the pulverized coal dust, carrier air for transporting the pulverized coal to the boiler burners and the primary air for combustion. If you’d like to speak to one of our engineers about ARVOS | Ljungström® Air Preheater technology, call us Toll Free at 1-888-317-8959.